The U.S. Federal Protective Service is an office within the U.S. Department of Homeland Security's National Protection and Programs Directorate. The U.S. Federal Protective Service was formerly an office within the U.S. Department of Homeland Security's Immigration and Customs Enforcement Agency. The Federal Protective Service employs over 1,200 Federal Police Officers, Inspectors, and Special Agents. These officers are tasked with the protection of over 9,000 federal buildings and properties that are either leased or owned by the U.S. General Services Administration or the U.S. Department of Homeland Security. More information about the FPS can be found here, and here. The Federal Protective Service is divided into 11 regions throughout the United States. 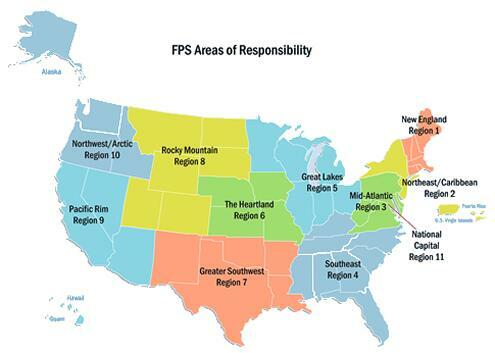 A map of the FPS Regions can be found on the DHS website. Each of these regions is assigned to a "MegaCenter" who provides alarm monitoring and emergency dispatch services to the units in the field. There are four such centers in the United States. More information about the MegaCenters can be found here. The first digits indicate what region the unit is assigned to. In this example "GEORGE" indicates that the unit is a Contract Security Guard. The third number is an individual officer number. The most common frequencies nationwide are 417.200 and 415.200. Squelch tones (PL, DPL, NAC) and actual frequencies will vary by location. Some areas are using APCO-25 Common Air Interface digital. Full time or part time encryption is also being employed by some areas and regions. *Quoted text denotes channel name.